The Fresno County Department of Agriculture's 2017 Crop and Livestock Report (Crop Report) was presented to the Fresno County Board of Supervisors Tuesday. Overall, the 2017 agricultural production value in Fresno County totaled $7.028 billion, showing a 13.58 percent increase from 2016's $6.18 billion. "Once again, Fresno County farmers and ranchers have produced an agricultural bounty for the world," stated Fresno County Agricultural Commissioner Les Wright. "While much of this food and fiber goes towards feeding and supplying our nation, the Fresno County Department of Agriculture also issued 18,604 phytosanitary certificates for 133 commodities destined for 97 countries around the globe in 2017." "This Crop Report is comprised of nearly 400 commodities, of which 73 crops exceed $1 million in value," Commissioner Wright continued. "Crop values may vary year-to-year based on production, markets and weather conditions, but our farmers and ranchers, their employees and all those who support their efforts work tirelessly year-around to bring in the harvest." With the great diversity of crops in Fresno County and the many variables in agriculture, it's a given that some crops will be up in value while others are down. Increases were seen in a majority of the Crop Report segments, including field crops, seed crops, fruit and nut crops, livestock and poultry, livestock and poultry products, apiary products and pollination services, and industrial crops. Decreases were seen in vegetables and nursery. Surface water supplies were significantly better in 2017, although many Westside federal water contractors received much of that good news too late to benefit them with additional annual plantings. Too often, the Crop Report gets summarized down to just a single overall number, but it yields a significant amount of information, such as the ability to examine changes and trends in crop acreage and yields. Amounts in the report reflect the gross income values only (income before expenses) and not the net return to producers. "The San Joaquin Valley is the food capital of the World, and Fresno County is the region's heart," said Fresno County Farm Bureau (FCFB) CEO Ryan Jacobsen. "Daily, millions of food servings unceremoniously originate within our backyard, the result of generations of families and agricultural infrastructure that has been built to furnish an unbelievably productive, wholesome and affordable food supply." "The annual Crop Reports are more than numbers," Jacobsen continued. "They provide the industry, the public and policymakers, regardless of the overall number, the opportunity to salute local agriculture and give thanks for the food and fiber, jobs and economic benefits, agriculture provides Fresno County." 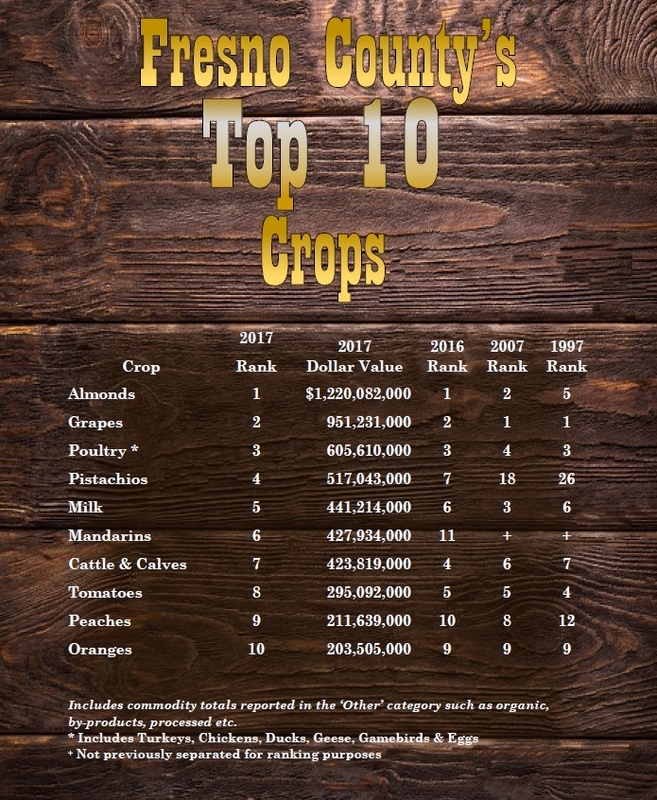 One popular component of the report is the review of the county's "Top 10 Crops" that offers a quick glimpse of the diversity of products grown here. In 2017, these crops accounted for three-fourths of the report's value. Almonds continue to lead the way as Fresno County's only billion-dollar crop in 2017, representing 17.4 percent of the total gross value of the Crop Report. Added to this year's list was mandarins at number six. Dropping out of the "Top 10 Crops" was garlic. This year's Crop Report was a salute to the Fresno-Kings Cattlemen's Association. The organization is one of 38 affiliates of the California Cattlemen's Association, a non-profit trade association that represents ranchers and beef producers in legislative and regulatory affairs.